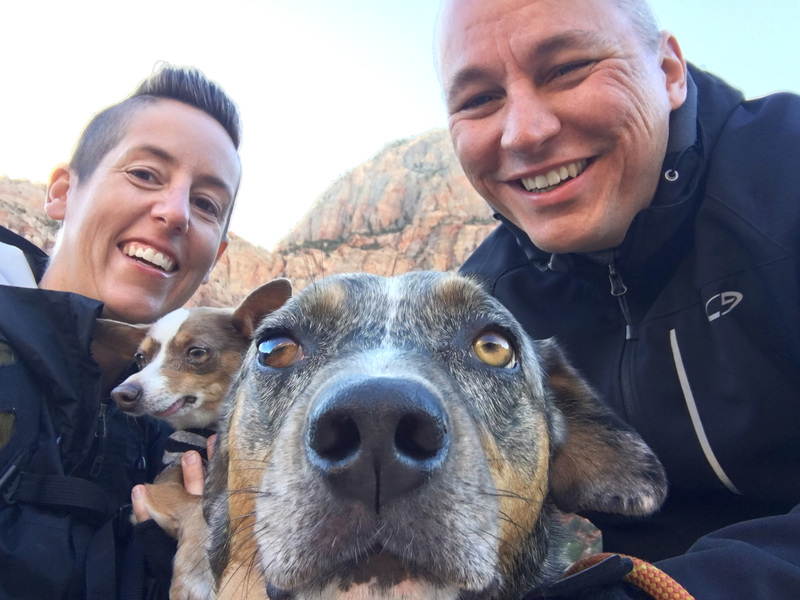 As we planned our first visit to Zion National Park, we learned it was one of the more restrictive National Parks when it comes to dog visitors. 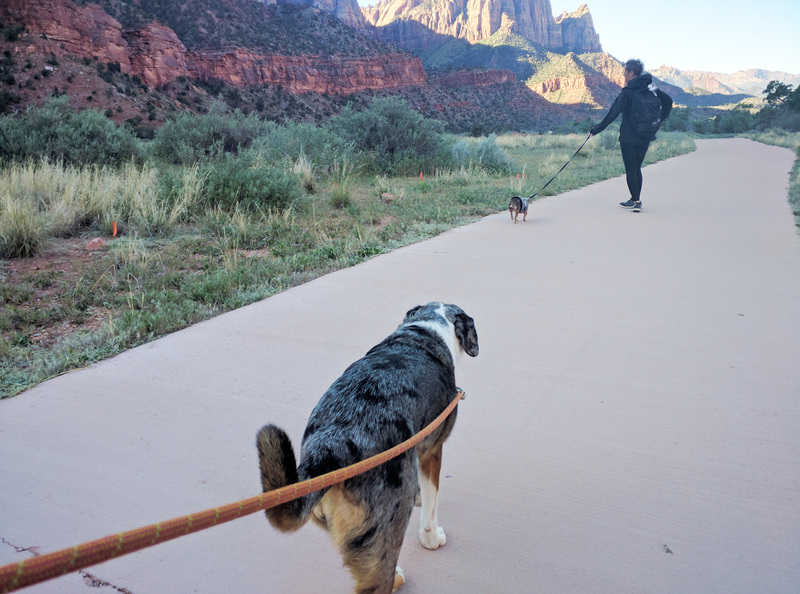 Dogs are only allowed on one pathway, the Pa'rus Trail which is about 3.5 miles round trip and a popular trail for bicycling. 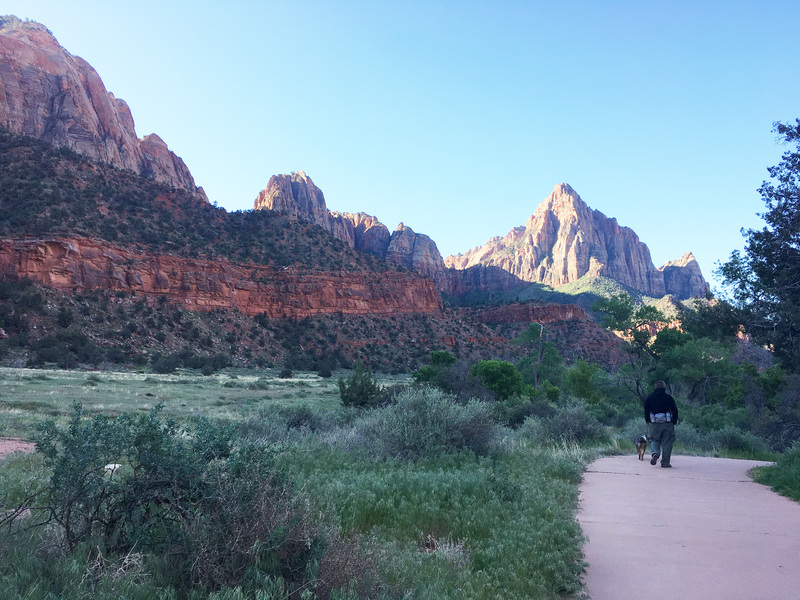 And although we have this blog post tagged with Hikes, it's really more of a walk. 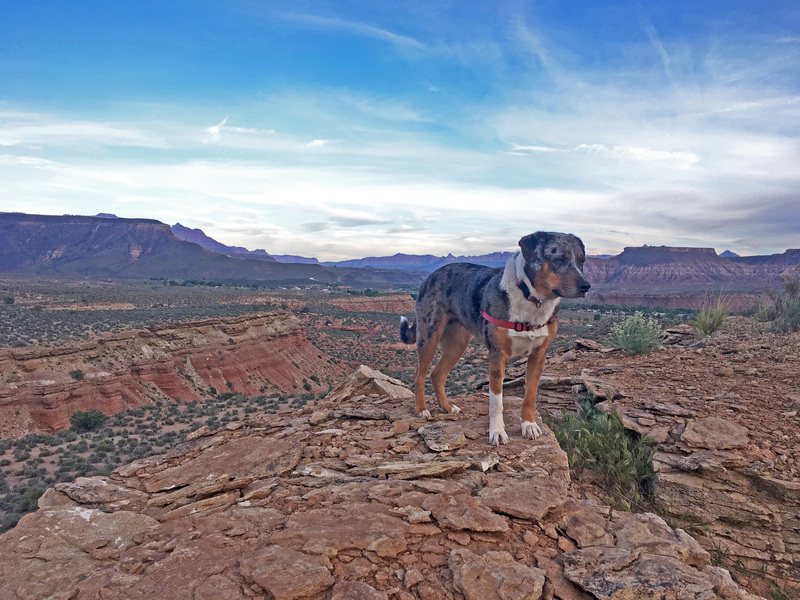 We were staying on BLM land about 25 minutes outside of Springdale, Utah. 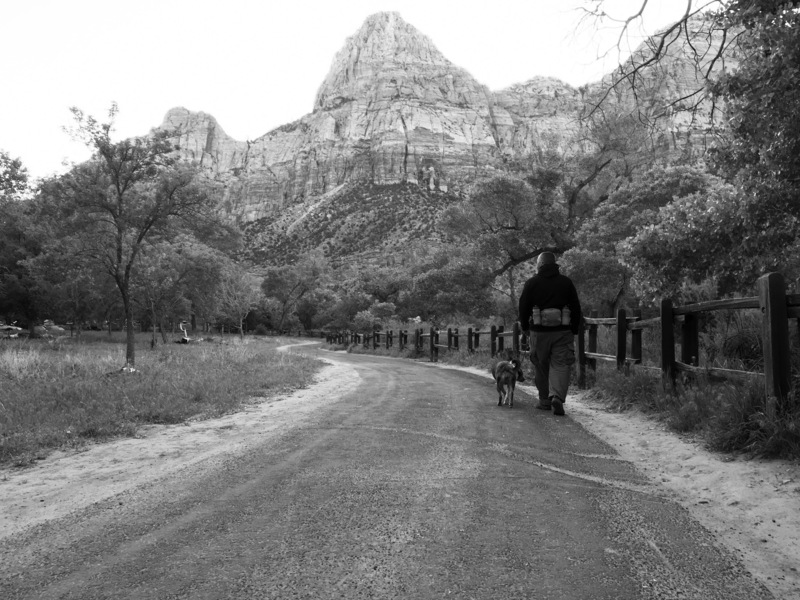 It's absolutely beautiful and the dogs had enjoyed being off leash and hanging out in dirt. 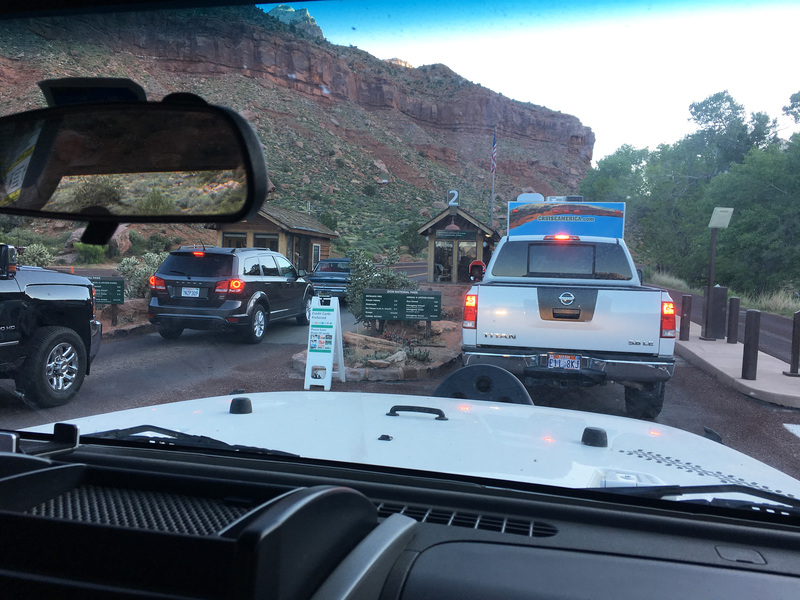 We set our alarm for 6am to ensure we got to the park early enough to get a parking spot at the visitor center. 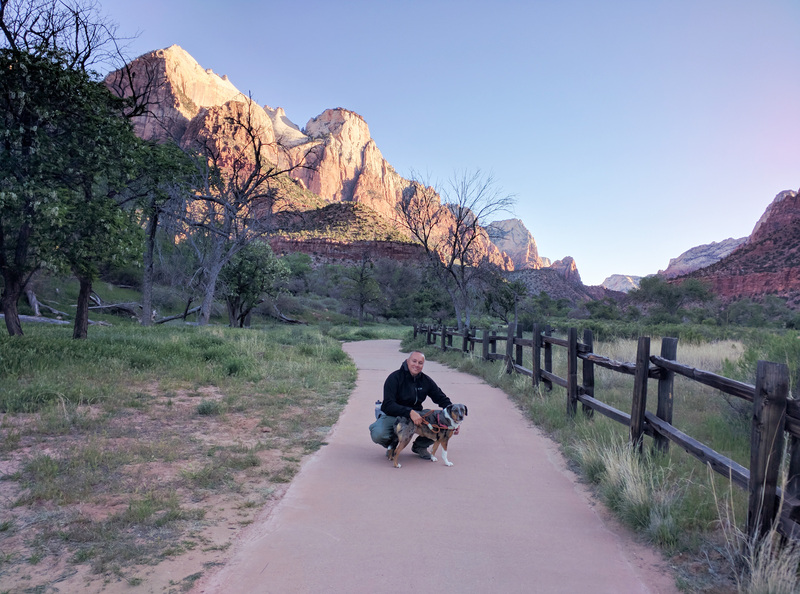 We had to drive in, as dogs are not allowed on shuttles from Springdale (nor within Zion). 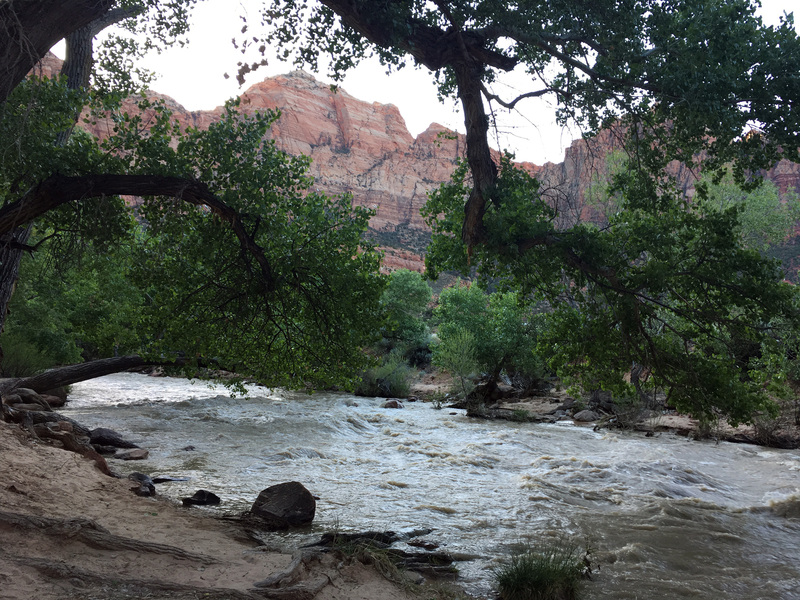 You could probably also walk in from Springdale, if the Zion lots are full. 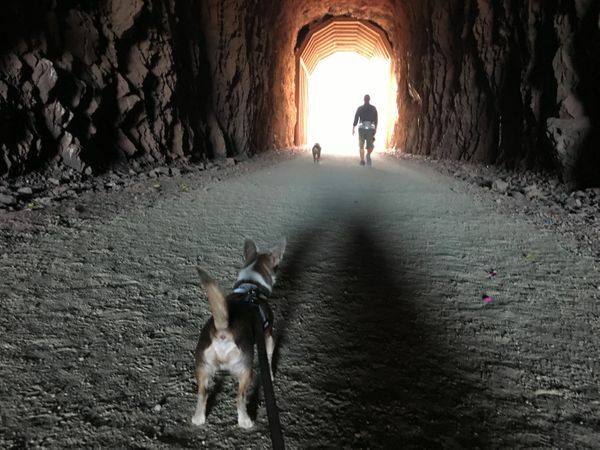 We also wanted to do our walk in cool weather so the dogs would be comfortable -- we had read that the pathway would be in full sun during the day. Shortly after 7am on a Wednesday, the line to enter was only 3 cars deep and parking was easy. 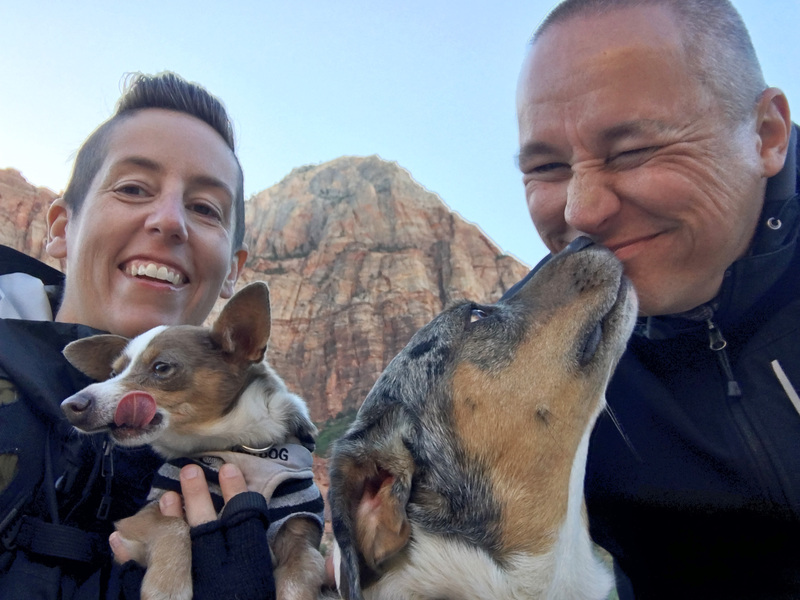 The dogs were instantly excited when we got out of the car so we were off to a fast start. It was chilly since the sun hadn't come up past the mountains yet. Lily, who normally walks calmly on a leash was pulling Tommi and quickly scanning left to right with her eyes. 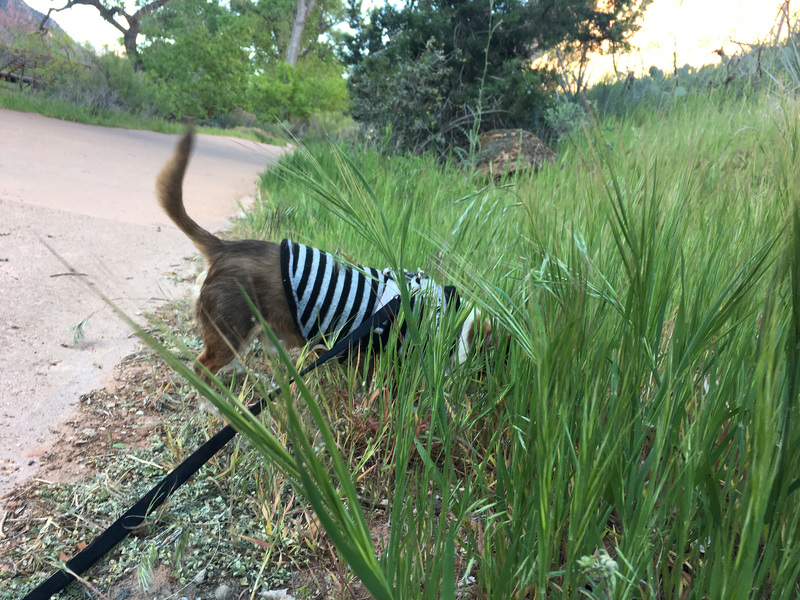 We think she was "hunting" for bunnies, even though she never saw one. She could have done this path two more times and still wanted to go back for more. 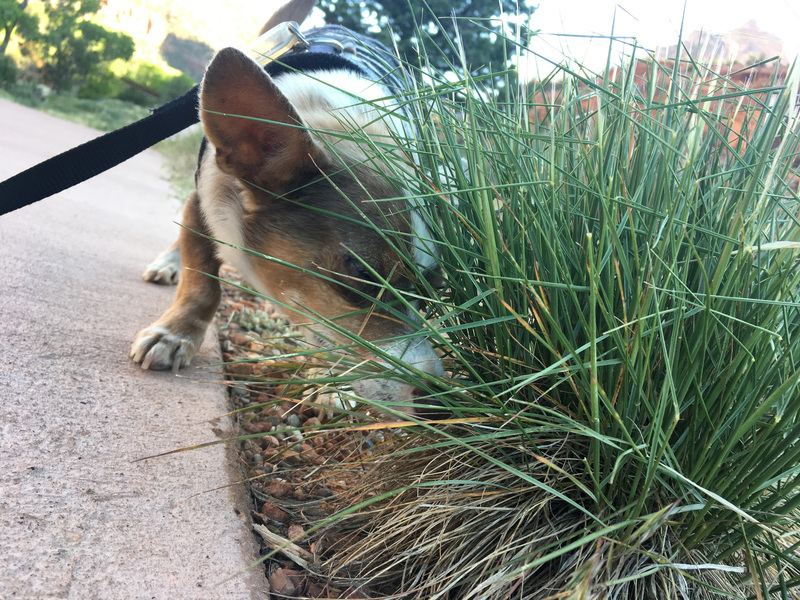 Such good smells! 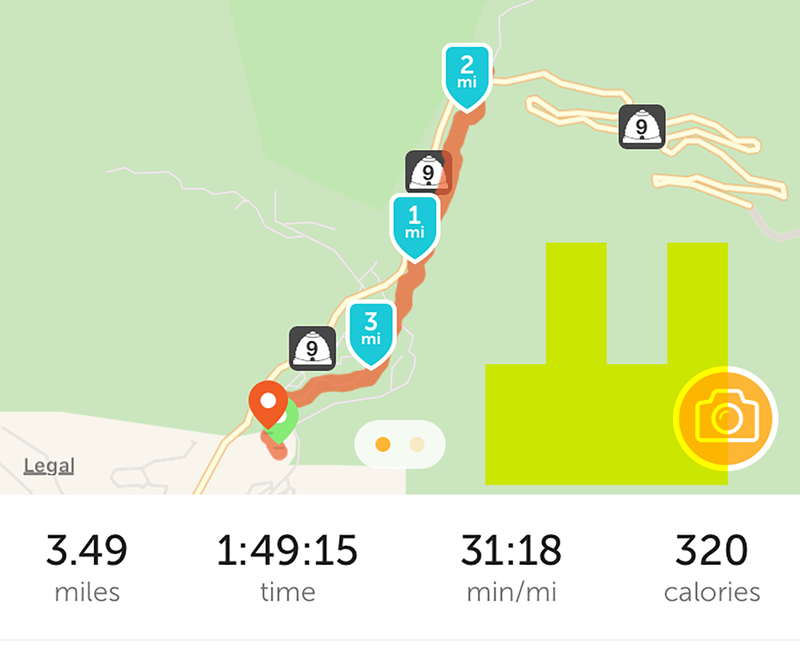 He walked the entire 3.5 miles with a pep in his step. 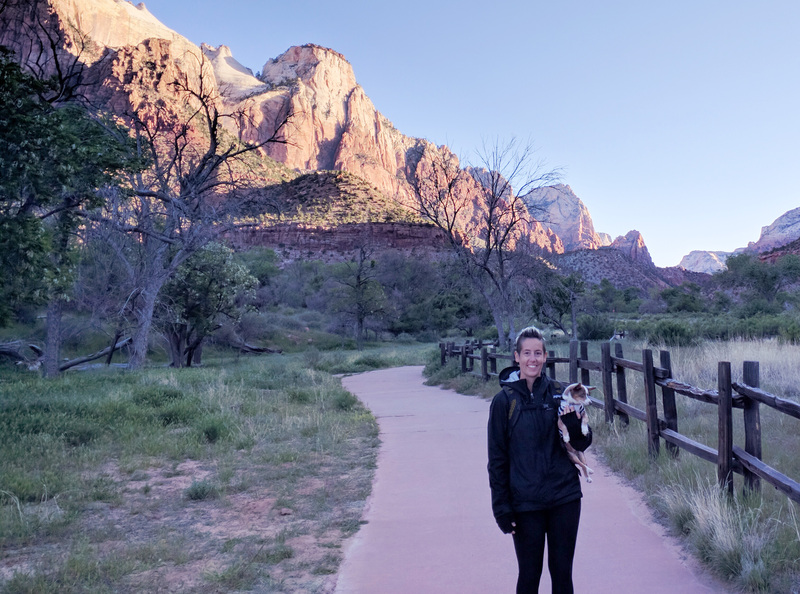 The entire trail is paved (which by the way, makes it a very accessible trail) and there are several sections with access to the Virgin river. 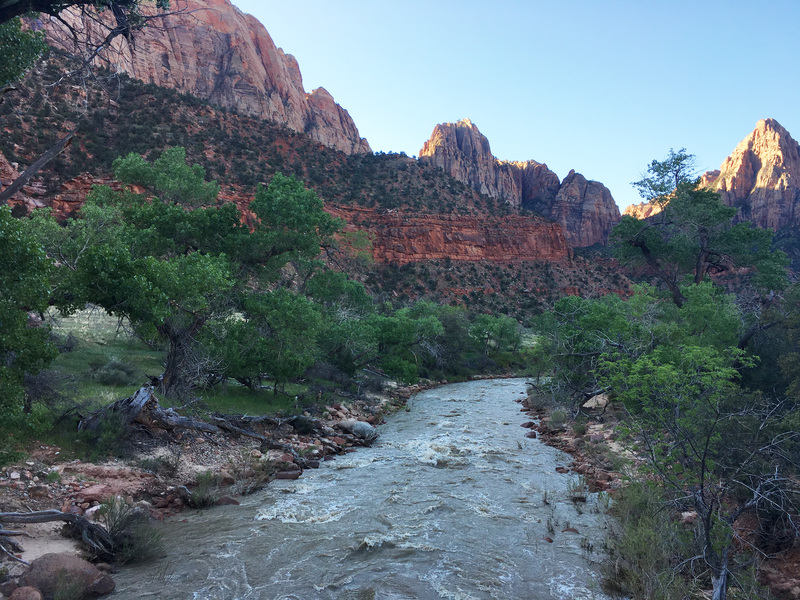 The river in mid-April was really rushing so we enjoyed it from a distance. It was a lovely sound to hear during the walk. 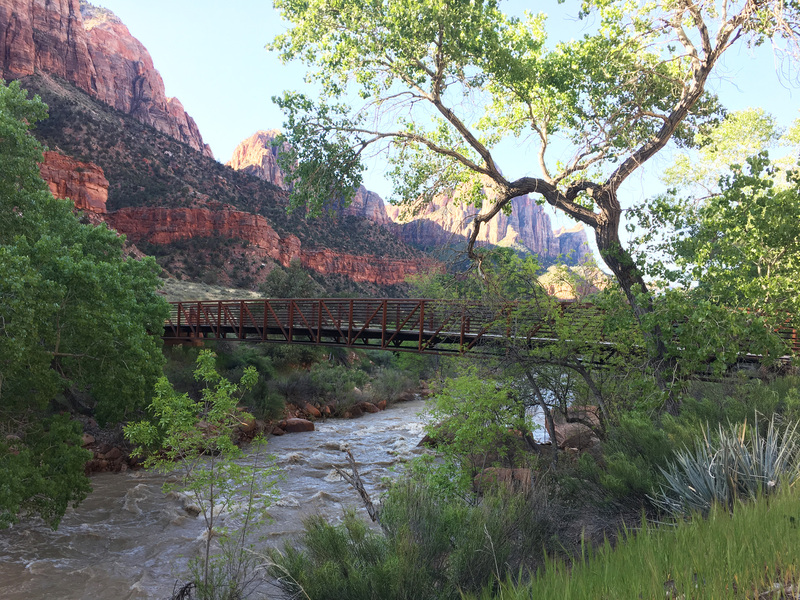 The trail crosses the river several times, which gives you some really beautiful views. 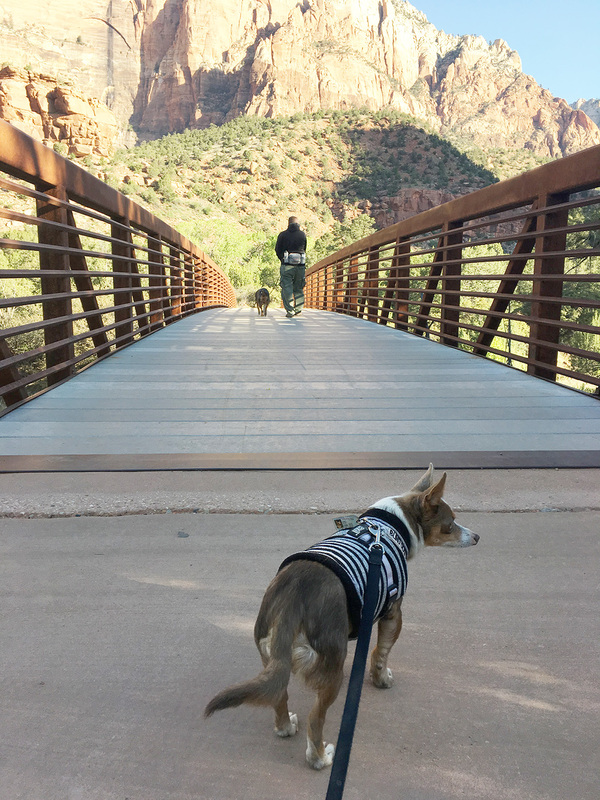 Lily had no problem with the bridges, but Stimpy had to be carried over most (sometimes he gets scared when the texture of the ground changes abruptly). 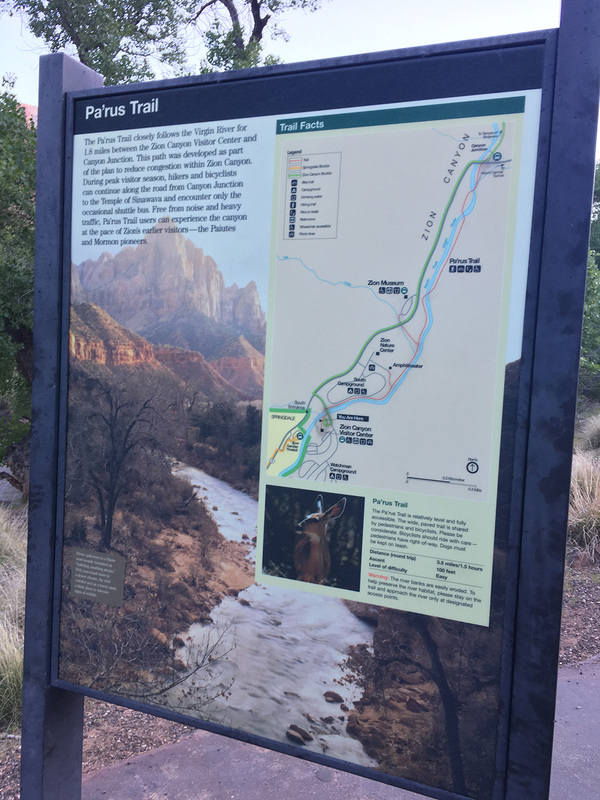 After about 1.7 miles you'll reach the end of the Pa'rus trail. There's no grand ending, just shuttle stop 3. We gave the dogs a drink of water and turned around. We always try to take a family photo on outings. Some are more successful than others. As far as Lily goes, we'll call this one "WHAT DID YOU EAT?" We exited the park around 9:45am and there were still parking spots available at the Visitor Center -- so I guess we didn't need to get there that early, but it was nice to have the trail (mostly) all to ourselves! 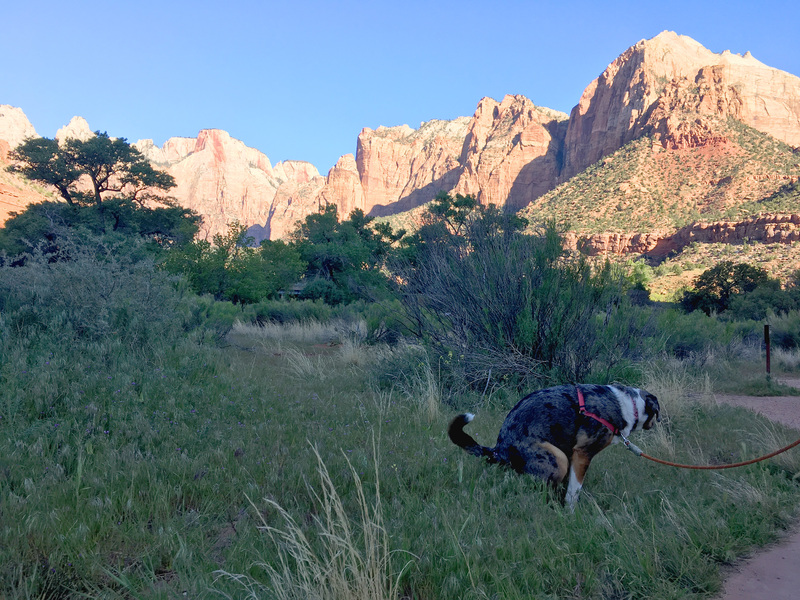 Is a trip into Zion with your dogs worth it if you can only do the Pa'rus trail? Well, that depends. For us, we were gifted the America the Beautiful pass (thanks Jen!) 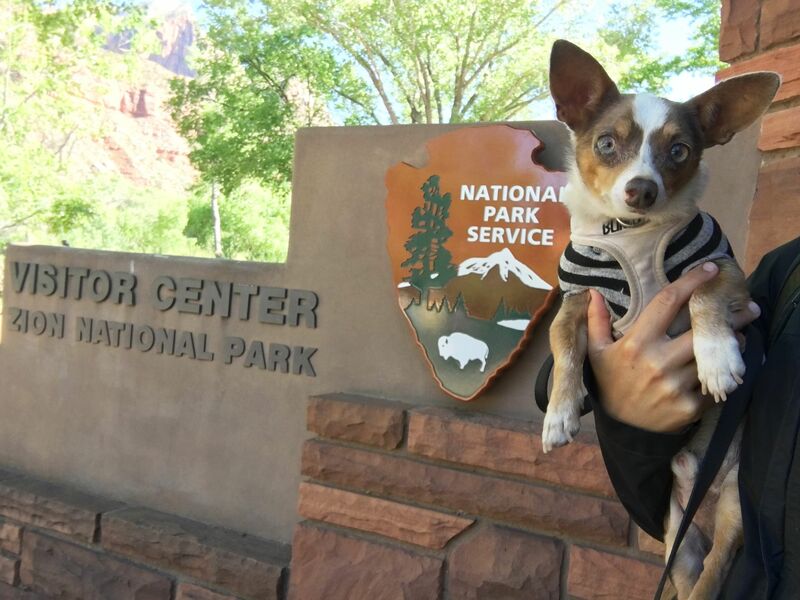 which allows us free entry to all national parks, so we didn't have to pay this morning. 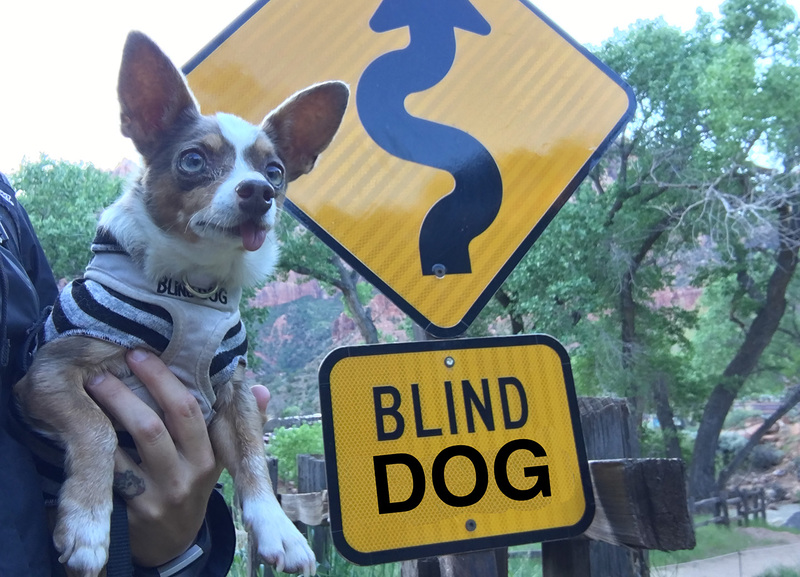 We also planned to come back another day without the dogs so we didn't feel like we were really missing out on seeing the rest of the park. 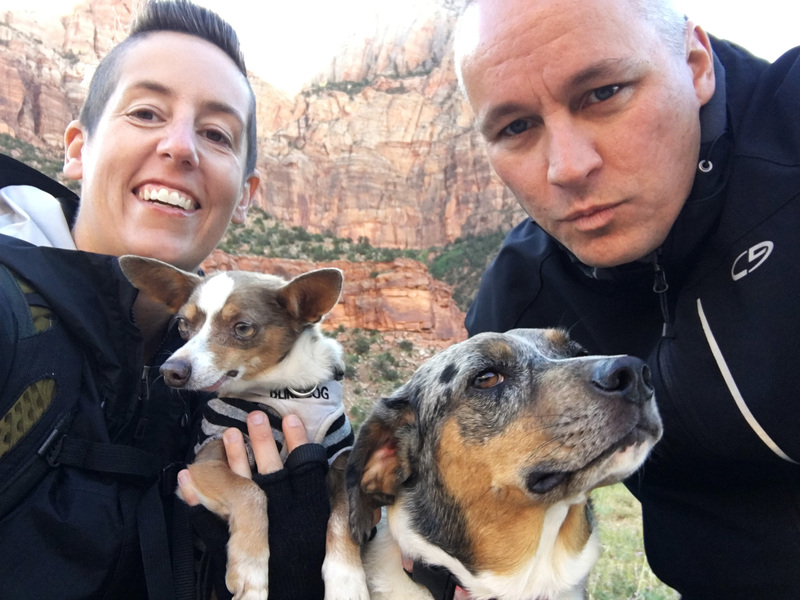 Our dogs really loved the walk so we felt it was worth it. 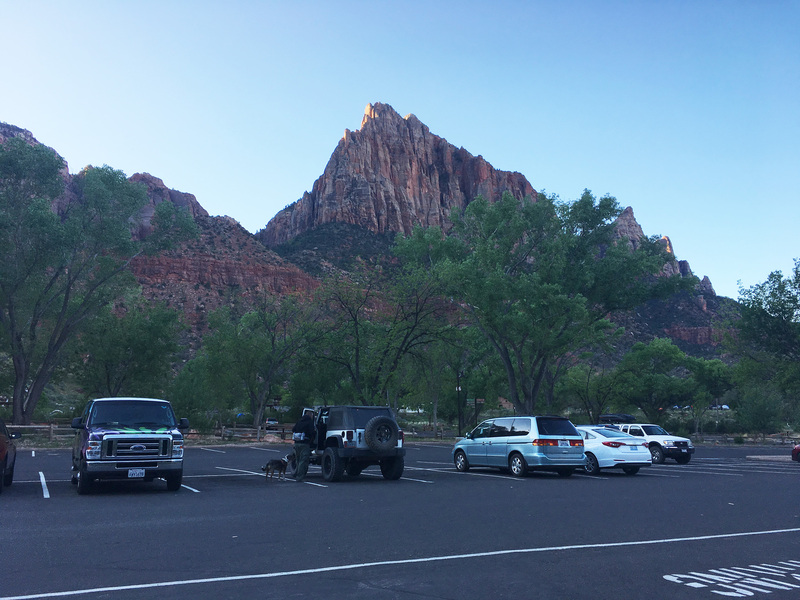 This morning, we left our awesome boondocking location and are now at a local RV park for two nights (at $45/night) so we can run the AC and leave the dogs behind and allow the humans do a day of real hiking at Zion. We didn't use them, but you might want to look into the nearby kennels and dog boarding facilities. 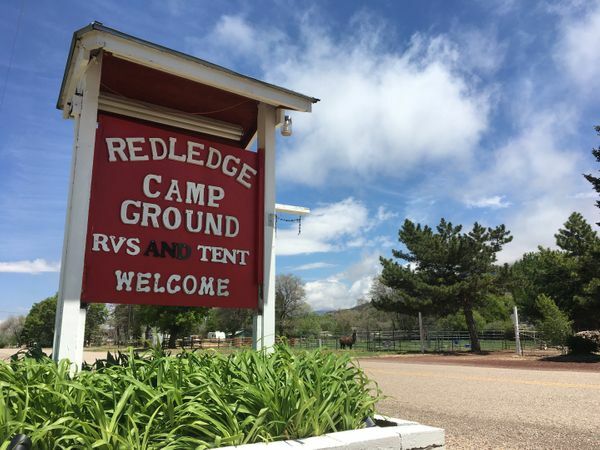 Those could be a good option (and might be cheaper than the RV park hookup).